It's one thing to have low expectations for a comic book spinning off of a video game. It's entirely another to have the project come in under those expectations. Unfortunately, the new Mortal Kombat X digital comic out this week does the latter. Look: like many fighting games, the story driving Mortal Kombat's to-the-death fights has been clunky and heavy-handed over the years. But, traditionally, it's been good for a dose of cheesy bombast and fancy-sounding pseudo-mysticism. There's never been much shading or nuance in the Earth-vs-Outworld beef but the focus on action in the games made that okay. The ebb, flow and momentum shifts in players' man-a-mano showdowns are the franchise's truest storytelling. From the very first, digitized version of Mortal Kombat 1, there was a clear line of connection the game's gory fatalities to the 1970s kung-fu movies that inspired them. 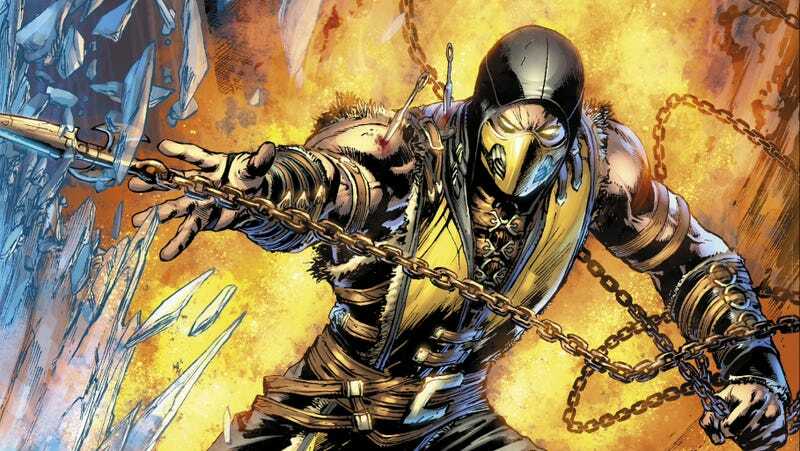 Written by Shawn Kittelsen with art by Dexter Soy, Mortal Kombat X #1 does deliver blood-drenched martial arts action but lacks the build-up that makes those moments impactful. From the very first page, it feels like you're starting a story already long in the telling. The creative team seems to assume that the reader might know the various characters and/or factions in the Kombat-verse. And while that's a fair assumption to make for a comic of this sort, the panels in this issue do very little to pull in lapsed fans or readers new to Mortal Kombat. The book opens with blind swordsman Kenshi on the run from members of the Red Dragon mercenary clan, until Scorpion intervenes and saves Kenshi and the boy he was traveling with. From there, it hops into flashbacks and moves around the globe, turning its camera to other familiar Kombatants as they chase down artifacts or each other. Now, I can't sit here and tell you what happened at the end of Mortal Kombat 9 but the comic that's supposed to connect that game with the upcoming Mortal Kombat X does nothing to make me interested. You have to already be invested the lore to get into this comic but nothing about the execution here will make you care about that lore. There's no drama or tension and even the familiar rivalries that MK players know about are absent from this debut issue. The reason that the various Street Fighter comics projects done by the Udon art studio generated such a fervent fan following years ago was because the execution embraced the goofy, over-the-top nature of Capcom's fighting game series. Wild camera angles, distorted body types, approaches to color that sometimes bordered on the psychedelic... all of those elements spoke to a passion for either Street Fighter, manga/anime styling or improving one's artistic craft. None of that comes through in the first issue of Mortal Kombat X. It's gory but only because it feels like it has to be. There's no sense of high-stakes here. It's entirely possible that some entertaining nuggets of information may come via this ongoing series. But, right now, it seems like any gold to be found will be surrounded by mounds of dreck.